Harvest is in full swing in Burgundy. 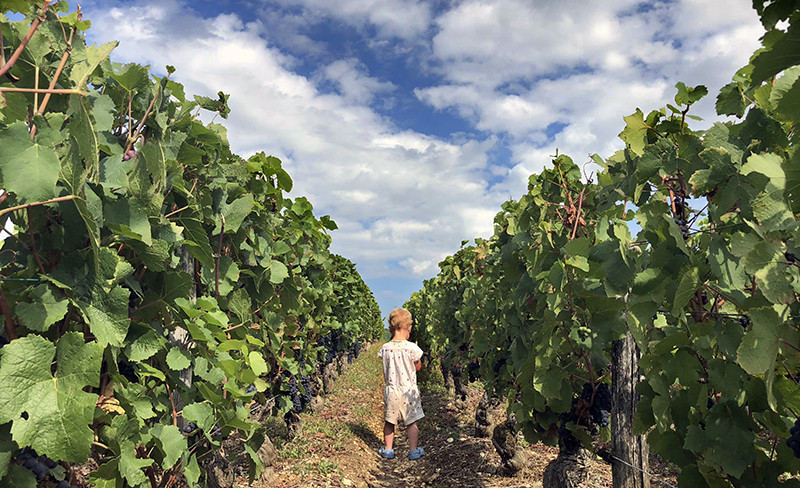 Yesterday we visited the Côte d’Or, where the air is alive with the fragrance of grapes and the chatter of busy harvesters. Most of this year’s white grape harvest has finished, and the grapes have begun their journey to becoming wine. Nearly all the white wines in Burgundy are Chardonnay, but 10% are Aligoté, a less celebrated grape that produces simple, refreshing wines. Aligoté is seldom magnificent, but in the hands of the right winemaker it can be delicious. Boyer-Martenot’s is our favorite, with a rich mouthfeel and unusually complex bouquet. Forget what you know about Aligoté — Boyer’s is real white Burgundy. From vines with an average age over 40 years, and an excellent vintage, Boyer’s Aligoté is smoother and rounder than most. The secret is his use of 5- and 7-year-old barrels to age the wine — barrels too old to impart much oak flavor, but which help micro-oxygenation and add softness and depth. In the nose Boyer’s Aligoté shows wild honey and herbs, with white flowers and classic green apple. The mouth is bright and lively, with a chalky richness that’s nearly unheard of for Aligoté. This is a perfect and versatile white for late summer and fall; and for readers interested in making kir, we have an exceptional crème de cassis. But with this Aligoté, the cassis isn’t mandatory — it is a crisp, pleasant glass of white Burgundy on its own. Previous post: Red Burgundy under $30 from a Master Winemaker.